Celebrating the life of Green (Jim) Lester, Jr.
Be the first to share your favorite memory, photo or story of Green (Jim). This memorial page is dedicated for family, friends and future generations to celebrate the life of their loved one. Obituary for Green (Jim) Lester, Jr.
Green “Jim” Lester, Jr. 85 of Iaeger, WV, succumbed to a long illness January 27, 2019 at 7:30 AM at the home of his daughter in Grove City, OH. Jim was born May 23, 1933, at Bull Creek near Mohawk, WV, a son of the late Green Lester Sr. and Armeda Hunt Lester. Jim served in the United States Army and was stationed in Germany during the mid to late 1950’s. Jim was a coal miner; he worked as an auger for approximately ten years, he was also a coal mine operator and an owner/operator of a coal truck company. Jim also worked at Lester Mobile Homes for twenty plus years. He loved moving mobile homes; every day was a different adventure. His hobbies were drag racing at Cedar Bluff, VA, playing pool; which he was very good at, and playing golf. If he could tell you his greatest achievement in life it would be when he gave his life to the Lord on August 28, 2016. Jim was the last surviving member of his original family. He will be sadly missed by all that knew him. In addition to his parents Jim was preceded in death by one daughter Mildred Ann Lester-Shannon; seven brothers, Alfred, Stewart, Mart, Cecil, Edward, Joe and Leander Lester; and two sisters, Martha Lester Rachel and Melda Lester Slone. Survivors include one daughter, Anita Lynn Lester-Huntzinger (Tim Browning); two sons, Jeff Lester (Drema) and Greg Lester (Nikki); grandchildren, Heather L. Sammons, Brittany D. Besonen, Savanna F. Huntzinger, Samantha A. Hall, Stephanie Lester, Trista Lester and Petyon Lester; ex-wife, Della Lester; great grandchildren, Derek, Brianna, Logan, Braylon, Danielle and Bailee; and numerous loved nieces and nephews. Funeral services will be conducted Friday, February 1, 2019 at 12 o’clock with Reverend Daniel Dean officiating at the Chapel of Fanning Funeral Home in Iaeger, WV. Following the services military rites will be conducted by the VFW Post #1144. Burial will then follow in the Green Lester Cemetery on the right fork of Bull Creek near Mohawk, WV. Family and friends will serve as pallbearers. 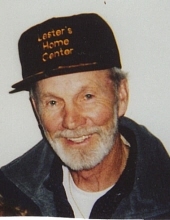 Friends may visit with the family Thursday evening, January 31, 2019 at the Chapel of Fanning Funeral Home in Iaeger, WV, from 6 to 9 p.m.
To send flowers or a remembrance gift to the family of Green (Jim) Lester, Jr., please visit our Tribute Store. "Email Address" would like to share the life celebration of Green (Jim) Lester, Jr.. Click on the "link" to go to share a favorite memory or leave a condolence message for the family.